7621 Pécs, Dr. Majorossy Imre u. 3. 1. Leave the M6 motorway at the 26th. 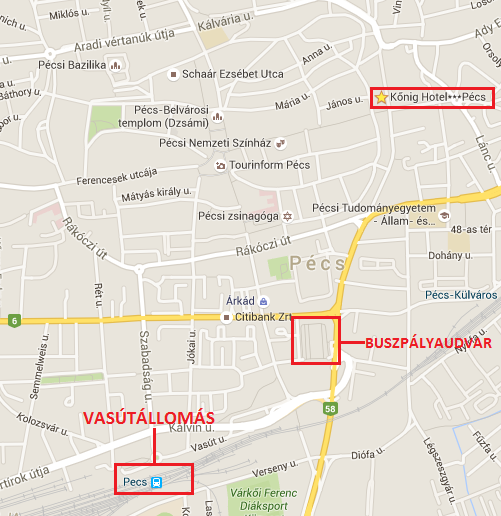 output at Újpetre/Pécs-Kelet direction. 2. Connect to the highway 578. and drive along to the first roundabout. 3. Leave the roundabout at the 2nd exit and drive along to the second roundabout. 4. Leave the second roundabout at the 3rd exit and drive straight ahead. where a plaque marks the location of the hotel. line into the downtown, where a plaque marks the location of the hotel. Follow the highway 6. on Barcs - Darány - Szigetvár - Szentlőrinc - Pécs line into the downtown, where a plaque marks the location of the hotel. 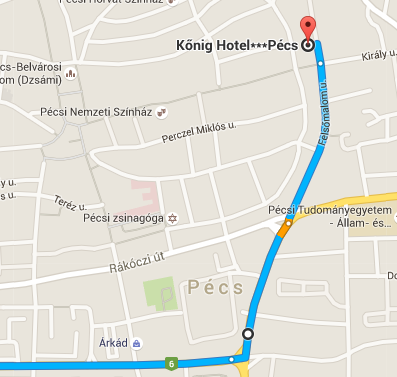 The hotel is located approximately 900 meters from the bus station in the northern direction. The hotel is located approximately 1800 meters from the train station in the northern direction.